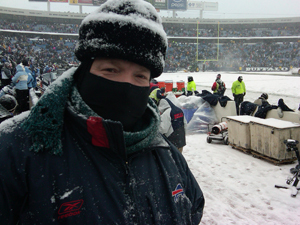 You are here: Home / Western New York State of Mind / The Snow Monster Returns: Buffalo Bills, Undefeated for the Decade! We love snow storms in Western New York. They challenge us. They define us. Ultimate, they prove who we are. We laugh haughtily when the cities of the east coast megalopolis shut down at the sight of a few flurries. They succumb to mere inches. We remain stalwart until we face several feet. But this particular storm had the making of a classic nor’easter. The last time we saw this same meteorological set up, I snuffed at the warnings and took some clients to a Sabres game one early March evening. When I left Marine Midland Arena (that’s what they called it then), only an isolated puffy flake or two fluttered from the silent night sky. Assuming the storm would crawl in from the west, I foolishly figured I could outrun it in my sprint east on I-90 to Mendon. I barely made it back to Batavia before whiteout conditions forced me off the exit and into a warm Days Inn. With three feet of dense snow accumulating in less than 24 hours, impassible roads, travel bans and – egads! – the-unheard-of closing of the Thruway from Batavia to Victor, I spent the next three days in Buffalo, leaving my wife and three small children snowed in and alone. On this Sunday morning, the gathering clouds (more specifically, the evolving wind patterns) suggested the possibility of a repeat. I discovered a very handy thing about Twitter. If you’ve got enough followers along your intended route, you can tweet for a weather update, go into the shower, and come out to some pretty good current travel advice. This can supplement what the radar image doesn’t reveal: Are the roads in good shape? What’s the present visibility? In your opinion, it is worth risking my life to go out in this weather? And I then proceeded to put on two layers of socks, three layers of pants and five layers of shirts. I brought two pairs of gloves, four hats (of increasingly larger size) and my pair of winterized Kodiak boots. Western New Yorkers may be resilient, but we don’t shy away from the proper preparations, either. There was never a question. I was going to go. I had three compelling reasons. First, I was taking a client to the game. Second, I really enjoy going to Ilio DiPaolo’s Restaurant after the game. Finally, rather than using the weather as an excuse to avoid something, any true-blooded Western New Yorker leaps at the challenge of confronting Mother Nature’s fury. In addition, two strong feelings permeated my heart (actually, my brain and my intestines). The gray matter in my head told me the warnings were overblown (the low pressure was too far east). My gut murmured – I don’t know why – this would be a game to remember. And it was. I saw the return of the Bills of the 1990’s – and I don’t simply refer to Jim Kelly’s presence on the sidelines (yes, he was there through the brunt of the storm). I mean the spirit of those Buffalo Bills teams that strode like Titans during an unprecedented Superbowl run that joyously irked the nation. (Can you not forget Bruce Smith’s tantalizing taunt “We’re baaack ,” said with a deviously teethy grin in front of national cameras?) You remember them. They were the ones who would thrive in a blizzard. They were the ones who feasted on dome-protected or warm-weather foes during the winter portion of the season. They were the ones who loved to play, practice and prosper in the combination of cold weather and lake effect snow. Should I have stayed home or should I have gone? While the weather impacted the drive to the game, it had no bearing on the drive home. Besides, if I didn’t go, I would not have had the opportunity to give TO a personal high-five as he made what probably was a final victory lap around the inner bowl of Ralph Wilson Stadium. Yep. My gut was right. And I could think of no better reward for it than a plate full of ravioli at Ilio’s. “A matter of pride.” Nuts, that would have made a great title! Thanks for the comment MJ. And, if I do say so myself, your “there’s no way I’m telling my future children that during the Big Blizzard, all that happened to me was I watched TV” comment reminds me of Patton’s opening speech. It’s classic! As for myself, I spent the blizzard of ’77 listening to Danny Neaverth on WKBW. My family had moved to Rochester by then, but I was absorbing every eyewitness report as if I had been walking in those snow boots myself.